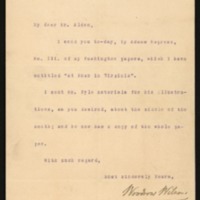 Woodrow Wilson sends Henry Alden the third volume of his biography of George Washington. I send you to-day, by Adams Express, No. III. of my Washington papers, which I have entitled “At Home in Virginia”. Wilson, Woodrow, 1856-1924, “Woodrow Wilson to Henry M. Alden,” 1895 December 31, WWP20445, University of Virginia Woodrow Wilson Letters, Woodrow Wilson Presidential Library & Museum, Staunton, Virginia.